Angela’s Farmhouse in Lauragh, Co Kerry sleeps 4 people. Breathtaking views. 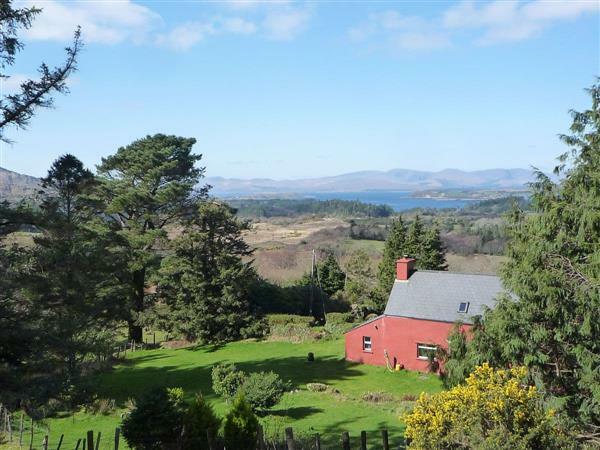 On an elevated site with a breathtaking view of Kenmare Bay, and the Caha range of mountains. The farmhouse has a charm of its own, having been skilfully renovated with excellent furnishings and fittings ensuring a very comfortable stay. The area offers a peaceful retreat for anyone, yet still within 16 miles of the historic town of Kenmare. Local attractions include numerous scenic drives, horse riding and golf at Glengarriff, 18 miles, and swimming at the local pier 3 miles. Killarney is 37 miles. Shop and pub 1 mile. Open fire (initial fuel included). Oil central heating and electric by meter reading. Gas . Bed linen and towels included. Cot. High-chair. Video. Washing machine. Tumble dryer. Outdoor furniture. Parking (2 cars). Holidays at Angela’s Farmhouse run from Saturday to Saturday. For a better idea of where Angela’s Farmhouse is, you can see Angela’s Farmhouse on the map below. Do you want to holiday near Angela’s Farmhouse (W5041), you can see other cottages within 25 miles of Angela’s Farmhouse; have a look to find your perfect holiday location.